Into the home stretch we go! Right now the electrician is almost finished, and the pine trim is going in around all of the rooms and windows. Mike is busy installing the small stuff like the closet systems, phone and network boxes, etc. The counters in the kitchen and bath should be done on Monday, with the final plumbing visit on Tuesday and Wednesday. We still need our sinks, faucets, toilets and water heater to start working, and then it’s time to finish up all of the county inspections and MOVE IN! Words cannot adequately describe what a long and difficult process this has been for both of us. Really only one word describes the step-by-step process of collecting just the right workers at just the right time to complete such a large and complex project. STRESS! Then you add in the phenomenal price of bringing all those experts to this rural area! YIKES! Another major problem with taking on such a difficult project is we have had all the stress with no real reward for over a year now. We are still left sitting in our dumpy 100-year-old rental in Walsenburg no matter how nice our new home becomes. Now, the rewards are within reach. Hang on, it all changes! 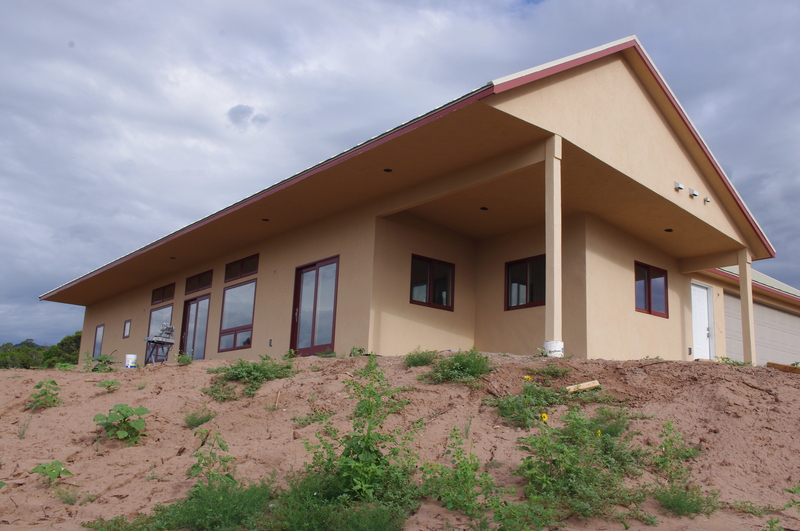 ← The NEW look of our new home in the foothills! Thanks for your support Kathy!